Beaducation: The Blog: Beaducation Original Lowercase and Uppercase Kismet in 2mm are here! Beaducation Original Lowercase and Uppercase Kismet in 2mm are here! I have enjoyed the touch of a solid steel shank between my thumb and fingers since my first stamping class with Lisa Niven Kelly seven years ago. But never did I really know what it was like to truly love a stamp set, until I felt the first touch of a nickel-plated Beaducation Original steel shank between my thumb and fingers. I discovered everything I had read was true. They are easier to impress into the metal! The letters all line up accurately and straight. They don’t rust (even though I live at the beach). The letters are engraved on the side of each nickel-plated shank, so I can find each letter with the greatest of ease and know which direction to stamp them! Most importantly, they come in my favorite font: Kismet. Lisa spent twenty pain-staking hours drawing and editing these letters to make them perfectly whimsical just for you and me! Well they are here! 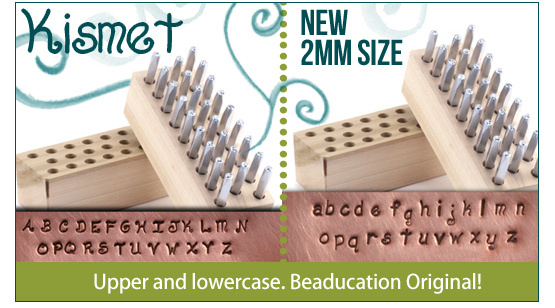 Introducing Beaducation Kismet Lowercase 2mm and Beaducation Kismet Uppercase 2mm! The highest quality stamping set in production is now in 2mm so don’t hesitate to buy one today. You will not be disappointed. Thanks Lisa! These babies were worth the wait.